As many of you might have seen at WWDC 2016, the new Playground app for the iPad was a really big hit! As an already playgrounds lover, for me it was even more than that. 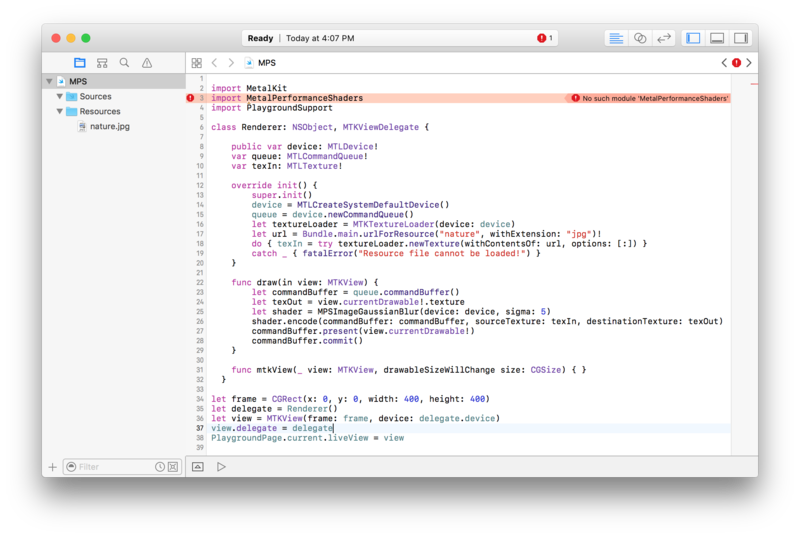 Now we are able to easily write Swift code on the iPad and run it with just a button tap. Today we are going to have fun with Metal Performance Shaders (MPS) since I have not discussed about them before, and also because it is so easy to use them on mobile devices. This reminds me to warn you, the MPS framework only works on iOS and tvOS devices. We will look into a handy way of writing the playground on a macOS device and then sharing it with your mobile device through the iCloud Drive. Also, the iPad playgrounds are working only on iOS 10 or newer. What’s great about the MPS objects is that they let you apply a compute shader (kernel function) to an input texture without us even having to configure any states, descriptors, pipelines or even write a kernel function, ever! The MPS object takes care of everything for us. Of course, by taking this approach we are somewhat limited to only picking a preset shader and possibly changing a parameter such as sigma, for this particular shader. Imagine the possibilities you have here by only changing one line of code! There are a couple dozen different shaders that you can try. Check out the Metal Performance Shaders API for more details. If you are interested in image processing, you might want to also check Simon Gladman’s Core Image for Swift book. If you want to learn more about the Metal backend of MPS, also check out Warren Moore’s Metal by Example book. The source code for the playground in this article is posted on Github as usual.